Ultra Joint Forte Reviews: Does It Work? Just like any other part of our body, joints are subject to wear and tear with age. The more we use them, the more they deteriorate and if you are having problems with arthritis or injury, the pain may become unbearable. Fortunately, there are supplements that may help you, but you need to be careful and pick the right one. This review will reveal can you trust Ultra Joint Forte to be a suitable supplement for your needs. What Is Ultra Joint Forte? If you are looking for a supplement that can provide joint support while boosting their overall health, you might consider Ultra Joint Forte. This product claims to boost connective tissue formation with a particular focus on joint cartilage. Aside from that, it promotes normal joint function, as well as elasticity and mobility. This joint pain relief product doesn’t forget about bones either and it can boost their density and strength, too. Ultra Joint Forte is designed for both males and females having trouble with acute and chronic joint pain. It is primarily meant for senior adults that are looking for joint pain relief and extra help in dealing with arthritis symptoms. Who Is the Manufacturer of Ultra Joint Forte? 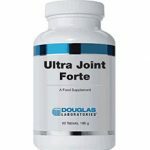 The company behind Ultra Joint Forte is Douglas Labs which was founded in 1955 and was a pioneer of the nutrition industry at the time. Over six decades of existence, they established an image of being there for health care professionals who want to help their clients promote an active lifestyle and healthy aging. The company is dedicated to maintaining quality and ensuring consistency across all their products. They have various supplements in their portfolio, including beauty, detox, and cognitive-boosting products. How Does Ultra Joint Forte Work? One of the main goals of Ultra Joint Forte’s working process is to assist in repairing and maintaining the connective tissues. Cartilage plays a vital role in your joint mobility and overall functionality and glucosamine, chondroitin, and some other ingredients work on helping it to repair and grow which subsequently protects your joint health. Aside from that, the product also supports normal joint function and aims to act as a pain reliever thanks to a triple combo of chondroitin, glucosamine, and MSM. Ultra Joint Forte Ingredients – Are They Safe & Effective? Astaxanthin – This pigment is found in shrimp and fish. It may boost the immune response of your body and help to deal with inflammation and oxidative stress. The list of inactive compounds includes dicalcium phosphate, titanium dioxide, silica, vegetable stearate, and cellulose. Please be aware that people allergic to shrimp and crab or shellfish, in general, should not use this product. What Are the Advantages of Ultra Joint Forte? What Are the Disadvantages of Ultra Joint Forte? How Should You Take Ultra Joint Forte? The label indicates that you should take a single capsule three times every day. This may be subject to change depending on the recommendation from your doctor. How Much Does Ultra Joint Forte Cost? The condition to purchase the product via the official website is to have a healthcare practitioner in their affiliate program. The suggested retail price for Ultra Joint Forte is $53.30. What Is Ultra Joint Forte’s Return Policy? The product is eligible for a return within 30 days from the delivery date, but only if the company pre-authorizes the return. If there is a damage or shortage, you need to file a claim within 7 days from the shipment. Shipping costs are not refundable and you can expect a processing fee of 15% when returning the product. Does Ultra Joint Forte Offer a Free Trial? No, there is no free trial offered for this supplement at the moment. Ultra Joint Forte is a health supplement that includes both chondroitin and glucosamine, which work well together and may act as pain relievers. On the other hand, there are some reviews where users indicate that they haven’t experienced any relief even after using the product for a month. The supplement supports normal joint function, but you need to use it regularly to notice optimal effects. If you are looking to reverse the cartilage loss process, Ultra Joint Forte may be beneficial for that. However, the dosage of astaxanthin is less than the recommended one, which may limit its effects. Ultimately, the product can also boost your bone strength and health, but keep in mind that the users who are allergic to shrimp or crab should avoid it. For all those still on the hunt for the right joint health supplement, there are many alternatives available on the market. We advise you to take your time until you find the perfect product as it is important to evaluate all your options first.